On Valentines day this year we headed to Santa Barbara with Tex and Honey for a wonderful day at the beach. Arroyo Burro Beach, also known as Hendry's Beach by local residents, is a public beach in Santa Barbara County, California that is dog friendly. From the parking lot at Arroyo Beach (Hendry's) you can walk to the beach, turn a left, cross the slough and you are in the off leash dog area. It was a beautiful warm day, with lots of dogs off leash having such a great time. 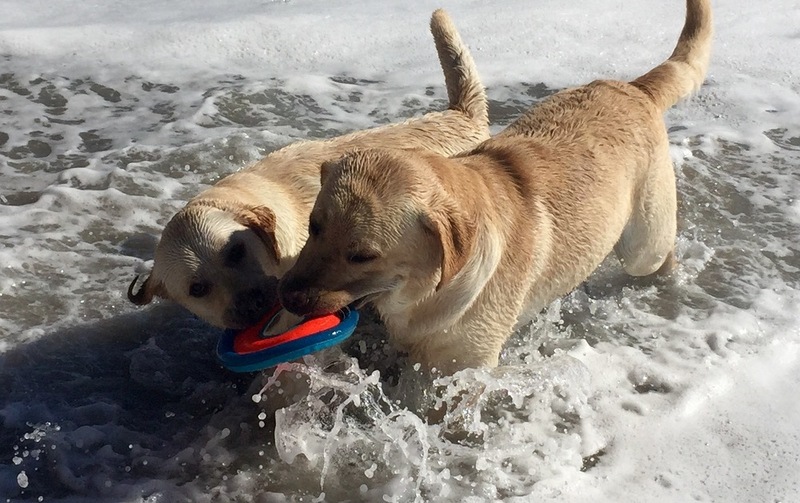 Tennis balls and frisbes were shared in and out of the water. All the dogs seemed to get along so well big and small. After a long afternoon we headed to the parking lot and found that there are two self-service dog washing stations in the marking lot run by the County of Santa Barbara. The machines are $10.00 for 10 minutes and allow you to shampoo, condition and dry your dog. What a great thing to have after a long day at the beach. No more sandy cars. Adjacent to the parking lot are several picnic tables if you want to picnic, or with all the beautiful views in Santa Barbara you can park and have a tailgate party.